Renowned for its steady, luscious climate, Singapore is something of a tropical island paradise. But with prolific rainfall alongside humid temperatures, elemental damage to your landed property is a real concern. Landed properties in Singapore are luxurious and functional – constructed with impeccable taste without compromising on practicalities – and you want to look after them. Rainfall and blistering sunshine don’t have to ruin your family gathering or a relaxing afternoon in the garden. Just as you can waterproof your roof to protect against leaks and rot, you can turn your garden into a year-round sanctuary with the perfect shelter to protect against overheating and downpours. But how to choose the best option for you? Here are some considerations before purchasing. From awnings to canopies, not all shelters are created equal. Awnings, glassrooms and glass verandas are permanent fixtures attached to your external walls and are perfect for entertaining guests on a patio. Glass fixtures are also a touch glamorous – stunning at night with the right lighting. Canopies, however, are freestanding units which best protect benches and other petite seating areas around your garden. Both protect well against sunlight and rainfall, however you should consider how you’re using your shelter carefully so you purchase the correct option. However you intend to use your shelter, you want protection from UV rays as the sun moves across the sky. You will also want something that will keep you dry on rainy evenings. Being prepared for all eventualities will give you total confidence in your shelter – and you’ll impress your guests with your versatile space. Just like your landed property, your shelter should be resilient and bespoke. You need to be confident that the fabric you choose for your shelter will be able to endure monsoon season and provide protection from harmful UV rays. Canopy fabrics are often vinyl, polyethylene or polyester – the latter of which is particularly useful in regions experiencing heavy rainfall. 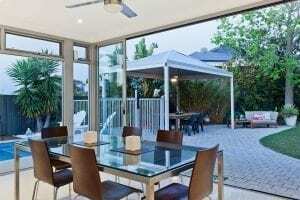 Glassrooms and glass verandas can be customised with blinds for shade and comfort. They are also surprisingly robust. For awnings, you need a UV-resistant and waterproof material with impressive durability – luckily, there are a variety of different fabric options. A professional can help you choose a fabric meeting the exemplary standards you require. Equally important is choosing the right style to best flatter your property. You want to add class – whether it’s something block-coloured and serene, or bold and fun. Make sure your shelter best reflects your personality and your landed property. You want a high-end shelter for a high-end property. Happily, most shelters can be accessorised and personalised with the latest technology to provide the best ambience. If you purchase an awning, invest in sensor technology and retractable coverings – the latest designs can recognise when it is raining or bright, and open and close in response. Even better, awnings offer fantastic protection for your furniture inside the home – keeping those beautiful tables and chairs near the window safe from sun damage. You can also add temperature and moisture control, to keep you and your guests most comfortable. Awnings, with their shade and UV protection, are perhaps the best option for helping to regulate the temperature around the home. Whatever you choose, you want features you can control at the touch of a button – saving you time and hassle. Options such as portable fires, ornaments, comfortable lighting and greenery all help create the perfect ambience you seek. Make sure to use your space wisely, to avoid the exterior looking cramped or bare – essential for elegant dining and entertaining. Whatever your shelter needs, the ideal bespoke option is out there for you. Always seek professional advice to best look after and decorate your landed property.